The Local Butcher Shop in Berkeley has a cut a deal with a local animal rights group, in an unusual agreement to put an end to often graphic protests. A summer special for a whole pig roast is advertised in the shop's front window. Tucked in the corner of a side window is another sign, courtesy of Direct Action Everywhere, that reads: "Attention: Animals' lives are their right. Killing them is violent and unjust, no matter how it's done." 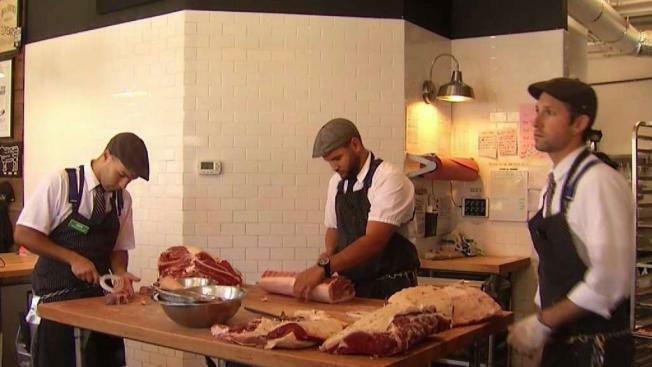 The butcher shop has built a repuation for providing sustainably raised meats to the neighborhood. So why is it advocating for the lives of the animals their customers will be eating? "The sign was the most palatable of all the options brought to the table. It was the least impactful to our business," said Monica Rocchino, co-owner of the Local Butcher Shop. The alternative was noisy weekly protests complete with people drenched in fake blood, wrapped in plastic and lying on cardboard trays. Tania Campos and other protest organizers with Direct Action Everywhere say they are working toward more than just getting stores to put up signs. They want all businesses in Berkeley, including super markets and restaurants, to go vegan. Customers like Augie Kue say it’s unfair that the animal rights group is picking on a small business. In the interim, though, the sign means the animal rights group can claim a victory, while the Local Butcher Shop can continue selling to customers, who are hungry for locally sourced meats.